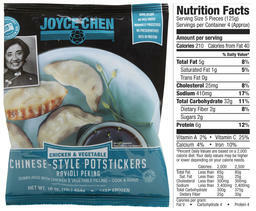 Joyce Chen Foods offers home-style potstickers that are based on Joyce Chen’s original recipes. 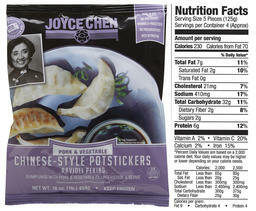 Following Joyce Chen’s philosophy, our potstickers are lower in sodium and fat compared to other brands. They have no textured soybean fillers, added MSG, or preservatives. Since these potstickers are made with unbleached flour. Our home-style potstickers have hand-rolled style skins that have more texture and thickness than the skins of our 05:00 Potstickers. Joyce Chen’s home-style potstickers may be boiled, and served as jiao zi* (boiled or steamed), or pan-fried and served guo tie*. These potstickers must be fully cooked since they are frozen raw. They are not microwaveable. Pan-fried potstickers are called guo tie, (stick to the pot) while boiled and steamed potstickers are called jiao zi. Ingredients: UNBLEACHED UNENRICHED WHEAT FLOUR, WATER, TAPIOCA STARCH, XANTHAN GUM (WATER, XANTHAN GUM), SOYBEAN OIL, POTATO STARCH, SALT, VITAL WHEAT GLUTEN. FILLING: CABBAGE, CHICKEN, WATER, NATURALLY BREWED SOY SAUCE (WATER, SOYBEANS, WHEAT, SALT), CHINESE LEEK, GREEN ONION, SALT, SESAME OIL (SESAME OIL, SOYBEAN OIL), GINGER, SUGAR, COOKING WINE (RICE, WATER, SALT, ALCOHOL), BLACK PEPPER. Ingredients: UNBLEACHED UNENRICHED WHEAT FLOUR, WATER, TAPIOCA STARCH, XANTHAN GUM (WATER, XANTHAN GUM), SOYBEAN OIL, POTATO STARCH, SALT, VITAL WHEAT GLUTEN. FILLING: CABBAGE, PORK, WATER, NATURALLY BREWED SOY SAUCE (WATER, SOYBEANS, WHEAT, SALT), CHINESE LEEK, GREEN ONION, SALT, SESAME OIL (SESAME OIL, SOYBEAN OIL), GINGER, SUGAR, COOKING WINE (RICE, WATER, SALT, ALCOHOL), BLACK PEPPER.